After the two-month negotiation and discussion of the product cooperation scheme, Parkway Display officially has concluded the 2017 POS Display project with Ferrero Asian branch, which include Floor Display, Counter Display, Pallet Display and Standee Display. Mostly use corrugated board as well as acrylic materials, those things are all produced by Parkway Display. After entering the era of commodity economy, the marketing of commodity lay great emphasis on the brand promotion and build of enterprise image, Kinder is a subordinated brand of Ferrero Company, each year it will volume-produce all kinds of sales promotion showpieces for shopping mall, and for various kinds of sales promotion exhibition, use the vivid exhibition to promote sales, win over consumers, gain the market and increase the profits. Parkway Display possesses powerful design team and highly skilled technician group, also well-equipped etc. after receive the client orders, Parkway Display can carry through the processes like scheme, design, print, package and storage in their own factory, thereby to achieve the standardization and controllable of orders throughout the whole processes. Finally, we have the chance to cooperate with Ferrero Company. 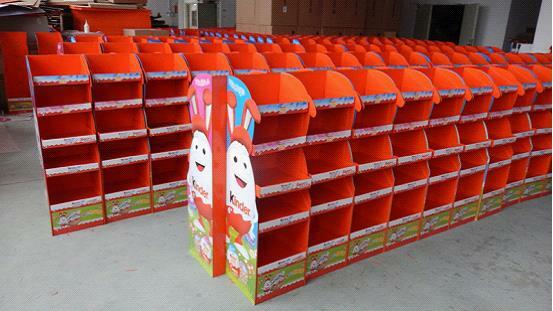 In accordance with the promotion activity requirement of Kinder on the Easter, the Easter egg is the theme on that day; we have designed cardboard display stands with various layers of layout. At present, the product department of Parkway Display already presents busy scenery. A responsible person of Parkway Display shows, they will provide sample design for free and coordinate the delivery time of product, and can design the most simple and easy to construct solution for the clients in accordance with their actual promotion demand, budgeted cost, and expected target etc. in the meanwhile of ensuring the top quality of our product, we can shorten the production cycle to 8-10 workdays. Parkway Display Products Limited was established in 2008, which is an entity type enterprise that specially produces POS acrylic display and cardboard display. As a professional producer that includes the businesses of package, exhibition, printing, production, transportation and storage, Parkway Display mainly provide package and exhibition display services for the clients in terminal shopping places. 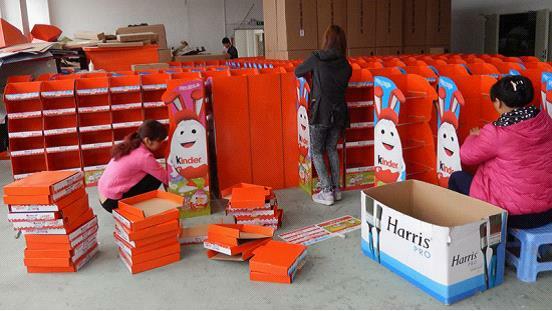 Since the foundation, Parkway Display has grown up into the outstanding company in the POS Display industry within few years; its export product rank top among this industry, in 2016, its annual sales is 200 million Yuan, among them 70% is export product. As a POS Display supplier of Ferrero Company, Parkway Display is not only the expression of honor and strength, however, we still have a long way to go and keep improving the quality of our product and services in the coming days. For more information, visit www.parkwaydisplay.com.